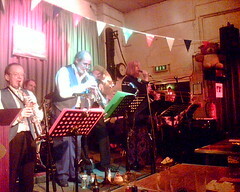 Last night I took my son up to the Pump House Jazz Club in Watford to hear his Grandad playing. I have been very slack in ensuring that my kids have fully appreciated their musical heritage on my side of the family. When I was a child every Sunday meant a trip to the Shantasea (later The Jug, now no more) in Albert Street in Central Birmingham to hear Big Syd’s band, a group of local jazzers playing in a mainstream side of traditional style – it’s where I heard many of the standards over and over again, one of which is usually going around in my head. And many Saturdays, especially in the summer, were filled with fetes, marches and shopping centre openings. and it was with the ‘Frisco style Big Bear Stompers with Judy on vocals that we saw him last night. Another treat was to hear Keith Nicholls outside of a dance band and to see him and Eve no matter how briefly. I last went to the Pump House about 20 years ago to hear Tony with the Zenith. The club doesn’t seem to have changed at all on the inside (outside a plethora of superstores has sprung up around it) and the crowd of regulars were heartily vocal in their appreciation of the Lu Watters and Turk Murphy offerings. You’ve been holding out, mate! Famous jazz daddy, self-styled crooner. . .Why weren’t you on stage last night, laddie? Or is that why there’s no mp3, video or other archival evience of this relatively cool moment. rosie, it was exactly like the old days… except without the smoke!